Given the preeminent holiness of the Virgin Mother of God, it follows that her parents are apportioned a special role in salvation history. It is said that St. Joachim was just as generous as he was wealthy — well-known for his charity and love of God. 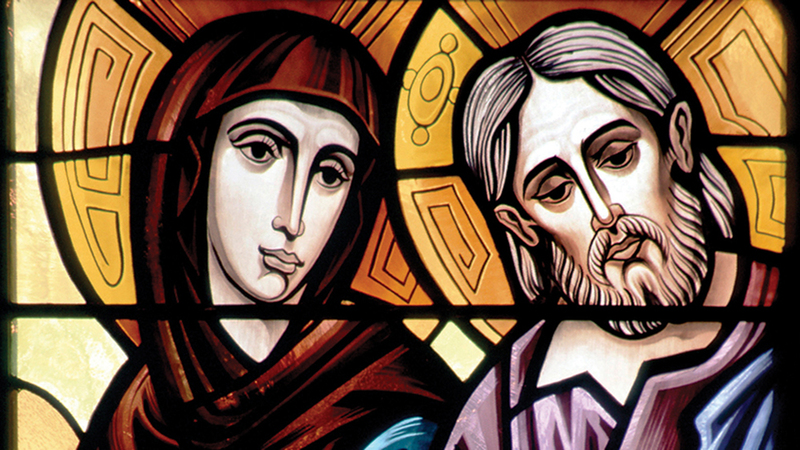 St. Anne’s name reflects the role she and her husband played in salvation history in a connection to their most blessed daughter, upon whom was bestowed the dignity of being chosen to bear God into the world. Anne’s name comes from the Hebrew “Hannah,” which means “favor” or “grace.” This speaks to the dignity of her blessed daughter, who is later addressed by the Archangel Gabriel as “full of grace” (Lk 1:28). Both saintly grandparents of Jesus are believed to have descended from King David. Tradition says that the temple priest in Jerusalem — where Mary’s family is said to have resettled in her childhood — rejected the pious St. Joachim’s sacrifice because the barrenness of him and his wife, St. Anne, was thought a sign of God’s displeasure with them. For 40 days and nights, St. Joachim retreated to the desert where he lamented by atoning through fasting and prayer. An angel ended the experience by bringing news that the holy couple would conceive a child. St. Anne also had received this word from an angel. At once they each set out to find each other and share the joy of their heavenly news. St. Joachim met his saintly wife at Jerusalem’s city gate upon his return, a scene often depicted in art with a kiss. The great faith of Sts. Joachim and Anne is seen when, in gratitude for God’s goodness in giving them a daughter, and in recognition of their daughter’s destiny for greatness, they brought the Blessed Virgin Mary to the Temple in Jerusalem to consecrate her to God. The awesome call that their daughter, Mary, would receive at the Annunciation set her on the path of motherhood — to God himself. It was from her holy parents that the young Mary learned to be a model mother and wife. The role that defines them the most is that Sts. Joachim and Anne are the grandparents of Jesus. It is not known, however, if they were present at his birth in Bethlehem. It is presumed that they were not, given the text of the infancy narratives of Matthew and Luke. Tradition also holds that the relics of St. Anne were packed up and carried off by boat to Gaul (modern-day France) by the saintly siblings Martha, Mary and Lazarus, who went there to spread the Gospel. And so, when the relics were discovered centuries later, one of the earliest centers of devotion to St. Anne was set up in France, at Douai. This patronage was kept by the French who settled our continent and dedicated the Canadian shrine of Ste. Anne de Beaupré, near Quebec City. The very flesh that the son of God took on at his Incarnation came from his Blessed Mother, of course, which means it comes from her parents, too. Their obedience to the will of God is a precursor of the obedience of Mary and Jesus, which obtained mankind’s redemption and salvation. Michael R. Heinlein is the editor of Simply Catholic. Follow him on Twitter at @HeinleinMichael.